It has been called the “greatest state park that never was.” In 1933, the Civilian Conservation Corps (CCC) began building what was supposed to be a beautiful getaway high atop Alabama’s Flagg Mountain, the southernmost mountain in the Appalachian chain. But, when World War II began, the project was abandoned, and Flagg Mountain was never developed as a significant destination for recreation. However, thanks to recent efforts by the Alabama Forestry Commission, volunteers, and local organizations, Flagg Mountain has been reborn, with newly restored CCC cabins and new regulations that allow camping on the mountain summit. Plus, area trails have been added to the extensive system of Alabama Birding Trails. With all of these developments, hikers, campers, bird watchers, and picnickers can all enjoy days of outdoor fun on the mountain. In 1933, a contingent of young men with the CCC came to Weogufka, Alabama, to build the state’s newest state park in Weogufka State Forest. Its centerpiece would be Flagg Mountain. The men began to clear land for what forestry and CCC officials proclaimed would be the most scenic park in the state. The Corps built several log cabins and a massive stone dining hall, and at the top of the mountain, they constructed a 52-foot tall tower made out of thick hand-carved stones. The tower was topped with a 12-by-12-foot room that offered a 360-degree view. To the north, you could see the light of Birmingham, and to the south Montgomery twinkled in the distance. But, the park never opened. The advent of World War II disbanded the CCC, and the facilities atop of Flagg Mountain were turned over to Alabama Forestry. In 1989, Alabama Forestry abandoned Flagg Mountain, leaving behind the incredible handy work of the CCC. As the southernmost Appalachian mountain taller than 1,000 feet, Flagg has always been targeted as a hiking destination with the hopes of bringing the state’s famous Pinhoti Trail to the summit. Until recently, that had only been a dream, but thanks to the work of the Alabama Forestry Commission, Alabama Hiking Trail Society (AHTS), many volunteers, and funding from such organizations as Conservation Alabama, that dream has come true. After 85 years of delay, Flagg Mountain is finally ready to welcome visitors to its summit. The operation is under the watchful eye of hiking legend M.J. “Nimblewill Nomad” Eberhart. Nomad first visited Flagg in the 1990s while hiking the Eastern Continental Trail from Florida, and he fell in love with it. Now, he’s the official caretaker. Over the past year, the mountain has seen a remarkable transformation. With the help of people from all parts of Alabama, from Huntsville to Mobile, four of the original log cabins have been beautifully restored to their original 1933 glory with a few new additions like electricity. The stone dining hall has been updated and is once again a cozy retreat with its massive stone fireplace. Also, there are new hiking trails that wind through the beautiful mixed hardwood forest. Also, regular events open to the public are now being held atop the mountain. The only CCC feature that is not accessible is the stone fire tower. While the structure is physically sound, the wooden stairs inside are dangerous and pulling away from the structure. When you visit, do not enter the tower. AHTS says it’s working to secure funds to fix the stairs and cab at the top of the tower to make it accessible to the public, but until then, it is still an amazing structure to see. AHTS is credited with creating the first trail in the area, the Flagg Mountain Loop. This four-mile path along the north slope of the mountain offers beautiful views and true solitude. While the trail used to be blazed with white markings, but it has been re-blazed magenta. On the mountain, you’ll find plenty of other fun and challenging hikes that range in length from 1 to 5 miles and lead to wonderful views of the surrounding mountains and valleys and take you along the banks of Weogufka Creek. The newest addition to the hiking trail system is Alabama’s long path, the 335-mile long Pinhoti Trail. In the past, the southern trailhead of the Pinhoti was located south of the mountain and the trail skirted around its base. Since then, the Pinhoti has been re-routed and now takes you to the top of the mountain and its fire tower and acts as the backbone of many of the loops now available. 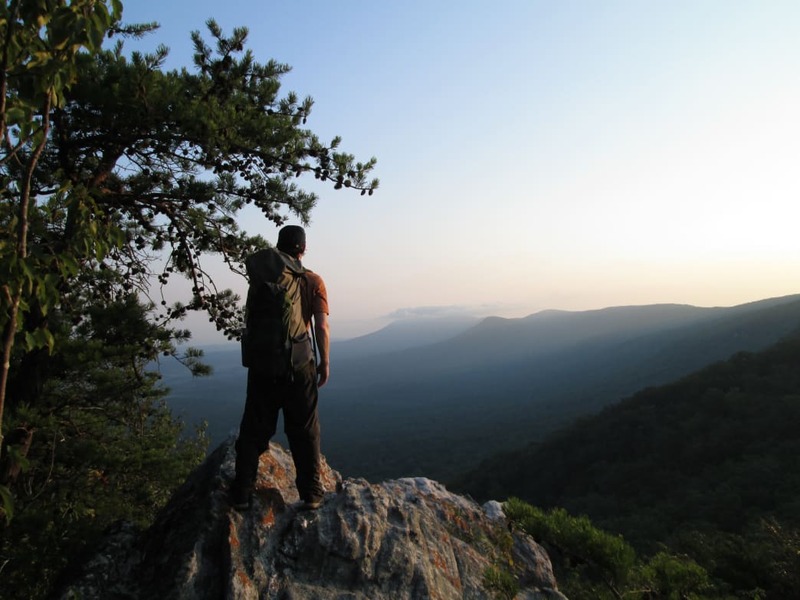 With this connection, you can walk the entire Appalachian Mountain chain from Alabama to Canada by hiking the Pinhoti, Georgia’s Benton MacKaye Trail, the Appalachian Trail, and the International Appalachian Trail, a trek of more than 5,400 miles. Flagg Mountain has also been added as a new stop along the statewide system of Alabama Birding Trails, which provides amazing opportunities for bird watching. In all, there are 280 sites scattered across the state from Huntsville to the Gulf of Mexico. Flagg Mountain’s open summit provides the perfect location to watch red tail hawks, Cooper’s hawks, and even bald eagles soaring over the rolling mountains. Dozens of songbirds dart in and out of the brush along the trails as you walk along, and you may spy Red-cockaded Woodpeckers happily tapping away in the canopy looking for their next meal. From Birmingham take I-65 south 51-miles to Exit 212 (Clanton). Turn left onto AL-145 North. Travel 1.8 miles and take the right fork onto County Road 55. Travel 19 miles and turn right onto the dirt CCC Camp Road. Travel 2.6 miles, turn right and you’ll see a gate and the road that leads to the fire tower. When you’re planning your trip to Flagg Mountain, keep in mind that there are gatherings at the picnic area throughout the year where you can connect with other members of the Alabama hiking community. For example, in the fall the Alabama Hiking Trail Society hosts a hiker gathering called AlaRuck. It’s a free event, and the public is welcome—just bring a dish for the pot-luck dinner. Another fun event is “First Friday on Flagg,” which is held the first Friday of each month. Free to the public, this “after-work/start-the-weekend” party is a covered dish potluck affair, so prep a dish and head to the mountain for hiking and fellowship. You can learn more about the gathering on the Friends of Flagg Facebook page. You’re in for a real treat when you spend a night or two on top of the mountain, especially in the fall when the autumn leaves are ablaze with color, or in the winter when a light dusting of snow covers the forest and all is still and quiet. Three of the four cabins are available on a first come, first served basis. Cabins are available for a donation of $25 per night, which is used to maintain them, and your stay is limited to three days and two nights. All cabins have power and a fireplace. Remember, don’t transport your firewood into the forest—AHTS provides firewood with each cabin. As for primitive tent camping, there is plenty of room for you to pitch camp with little issue of overcrowding. There is no water service currently to the mountain, so whether you’re tent camping or spending a weekend in a cabin, be sure to pack along your own. The fire tower is currently off-limits for safety reasons. Please visit the caretaker when you visit the mountain. Nimblewill Nomad is located in Cabin #4. Hey, you may get a tour and a history lesson. Whether you spend a few hours or a weekend on the mountains, don’t forget to pack along water. The Alabama Forestry Commission has changed the rules and hunting is no longer allowed in Weogufka State Forest. For more information, visit AHTS, Alabama Birding Trails, or the Alabama Forestry Commission online.